At Northoak Chiropractic, we believe that eye function is a great window into understanding brain function. Vision is the only sense that uses almost the entire brain and there are many types of visual activities and eye movements, each of which uses some unique combination of neurological pathways. By observing irregular eye movements or other visual problems, we can gain a lot of information about which areas of the brain are affected — and better understand the causes of a patient’s disability. 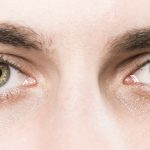 In this post, we will discuss two types of eye movements: smooth pursuit and corrective or refixation saccades. We’ll also explain how these movements can cause some common PCS symptoms, such as headaches, and Dr. Jay will provide a brief example of how he may treat these conditions in some post-concussion syndrome patients. Our eyes have to work hard to follow moving targets. When a healthy pair of eyes follows a moving object, this type of eye movement is called a smooth pursuit. We use these movements all day to maintain our gaze while reading on our phones, scrolling on the computer, or even watching television. As we discussed in our last blog, an object needs to stay in the fovea of the eye to stay in focus. With a moving target, this requires a great deal of fine control of the eye muscles, using feedback from several areas of the brain. Brain injuries damage the connections between different areas of the brain, which can cause our smooth pursuits to fail. As a result, the eyes of a PCS patient will fall behind the target, or even get ahead of it as it moves. When a smooth pursuit fails, your eyes will slip off the target — and it will fall out of the fovea. To correct the error, your eyes will make a quick jumping movement called a refixation saccade to put the target back in focus. Did you know that when your eyes are making a saccade, you are blind? For the 10th of a second that it takes for the eyes to jump to a target, the brain is only seeing a stored image of what you last saw before the saccade. The average person will do thousands of saccades in a day. However, when our smooth pursuits are impaired, then we have to make even more of these corrective saccades than before and we begin to feel more disoriented. 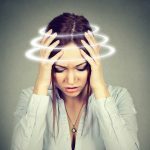 PCS patients sometimes describe this as feeling “out of it”, “foggy” or “in a daze” — it can also cause headaches. If you’re a PCS patient, you may feel overwhelmed in busy visual environments like shopping malls — or even just watching TV. An increased number of saccadic eye movements are what’s causing these situations to become problematic. Read more about saccades here. The specific treatment for irregular eye movements will differ from one patient to another, depending on which areas of the brain have been damaged. Here is one example of an exercise that Dr. Jay has used in the past — please remember this is NOT a recommendation. Do not try this at home if you have PCS, as it could be harmful in your case. Problem: Patient Y has good gaze fixation for stationary targets, but cannot follow moving targets to the left. Exercise: Patient Y keeps their eyes fixed on a stationary object and rotates their head to the right, moving the eyes smoothly to the left. The exercise is repeated to drive neuroplasticity in the injured pathways and improve left eye movements (pursuits). Each patient’s treatment plan will be composed of many exercises and stimulations specific to their injury. To learn more about treatment plans for post-concussion syndrome (PCS), please give us a call at (905) 338-5951 or contact Dr. Jay and his team at Northoak Chiropractic.